Once upon a time, I worked in a few kitchens. Not many, only a few, and for only a handful of years. But they were good, and long and exciting. While I certainly took more than just these 11 pieces of information away with me (like say.. how to chop an onion and peel a shrimp… oh my I was shamefully lacking in knowledge) these items seem so to be the most useful. 1) Keep your salt and pepper in a little dish perfectly mixed to your liking. If you feel fancy use white pepper, or don’t. I keep mine on top of my oven for easy access, ready to go. 2) Chop your vegetables to a uniform size. They cook evenly and it makes for an attractive dish. 3) Mise en place. A place for everything and everything in its place. While those who know my kitchen would scoff at this one, I know in my heart of hearts a few working drawers, a lazy susan that turns and some adequate space and I will, oh I will take my own advice… It makes all the difference in the world. 4) Work Clean. Chop on one side, compost on other. Scrape, wipe and crumb as you go. It will make your clean up more efficient and it expedite the cooking process too. 5) While I am on the topic, a cold beer assists with the cleaning process as well. 6) Taste everything. Taste it raw (within reason! ), taste it while cooking, taste it almost done, taste it perfect. And then please, oh please, taste it at your seat, in between a few laughs and good conversation. 7) There is always ingredients enough for a delicious soup. Even when you think you are more than ready for grocery day, scrounge and be creative and I promise you will come up with a soup worthy of the crusty bread you can surely whip up (if you think it’s too time-consuming…. you are wrong and I am not going to say why right now. But soda bread, and no knead bread are hints.). 8) It is just breakfast… lunch…. supper. I can remember customers complaining and thinking in my head, “Come on mister, its lunch.” You get another meal in a few hours. You too, as the cook, get another chance to please and impress your family, guests and your very own taste buds in a mere matter of hours. Don’t worry about the failures. Just try again. 9) Read cookbooks. A lot of them. I remember going to my friends (and fellow employee and amazing wonderful teacher in the kitchen) house and sitting on his bed while he showed me a few of his most prized cookbooks; The French Laundry being one of them. A few weeks later I took the enthusiasm he passed along to me and spent the money on this pricey item. I still pine over every recipe. My cookbook collection is one of those things that make me materialistic. I love them. 10) A good sauce goes a long way. Take the time to learn to make them. save yourself from boxed cereal…. cook something! This entry was posted in food and tagged 11 things I learned from working in a kitchen, cooking. Bookmark the permalink. 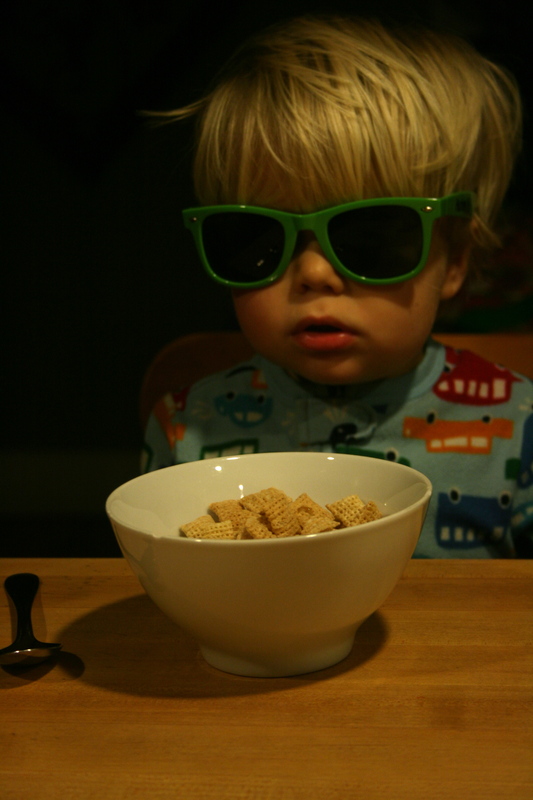 I am proud that my little babe has never had boxed cereal. She doesn’t need to wear her cheap sunglasses at dinner or her sunglasses at night. 🙂 I’m with you on the clean as you go and the cold beer (well, make mine a glass of sweet white wine). My husband is just a believer in the cold beer.